Are childbirth problems haunting you? In a traditional society like India, birth of a child has always been a priority after marriage. There was a time, when if a woman is not able to conceive immediately after marriage, her in-laws would curse her for not giving an heir to the family. But things have changed with time. Now, educated people prefer to consult a doctor and go through a medical examination to find out if there are any medical reasons for not having being able to conceive. There are cases where the doctors provide reassurance to the couple to stop worrying as there is nothing wrong with them biologically/medically, but still the couple is not able to conceive. This is when astrology comes to the aid of such couples. 1.To see whether it is a case of childlessness. 2.To see whether it is a case of delay and not denial of a child birth. If the horoscope promises the birth of a child, the timing has to be seen from both dasha and transit of the planets. In all such cases, first the horoscope of the man is examined for the possibility of a child and later, the woman's horoscope is examined for the time of conception. 1.Examine the 5th House and 5th Lord from Lagna. 2.Examine the 5th House and 5th Lord from Moon. 3.Examine the 5th House and 5th Lord from Jupiter. 4.Examine the 5th House and 5th Lord from Saptamsha. Children are born in the dashas connected with the 5th House or the Lord of the 5th House or of Saptamsha. An afflicted 5th Lord, which can be combust, retrograde and aspected by another retrograde planet, generally a malefic, results in delay of child birth. 1.The 5th House has retrograde Saturn aspected by Sun. This signifies delay in conceiving a child. 2.Lord of the 5th House, Jupiter with Venus in 10th House is good. 3.In Saptamsha, Saturn, Lord of the 5th House is aspected by Jupiter, which again promises a child. After coming to a conclusion on the husband's horoscope, similar examination of the wife's horoscope should be done. 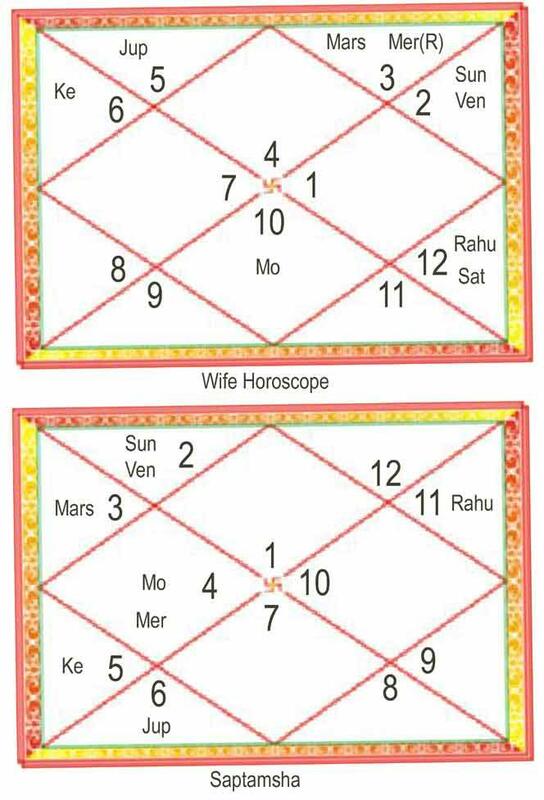 1.In the wife's horoscope, 5th House Lord has gone into 12th House. This is not favourable. 2.The 5th House has the aspect of Sun and Venus, which is promising. 3.From Jupiter, Saturn aspects the 5th House along with Mars and Mercury. This is a case of delay, and not denial. 4.In Saptamsha, the 5th House has Ketu but the 5th Lord is with Venus aspected by Jupiter. This too promises of child birth, though delay is possible. 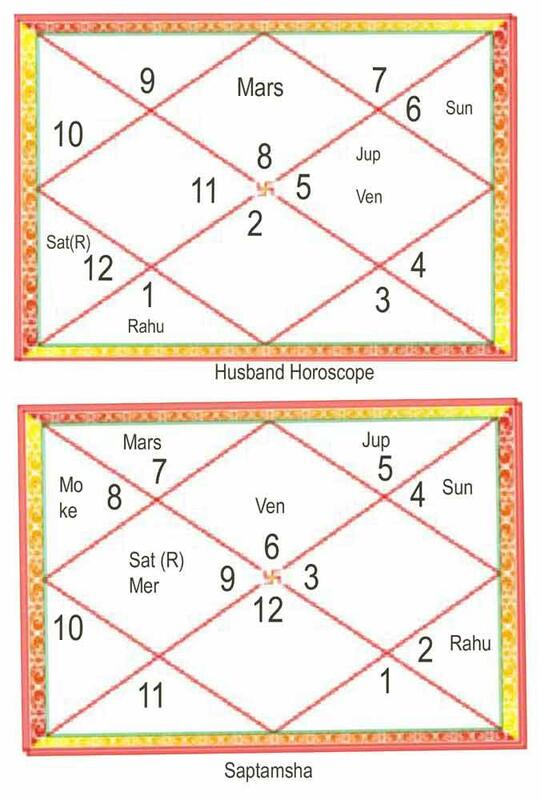 In 1998, husband's Saturn dasha started which is in the 5th House. Moreover, Saturn is also the 5th Lord of Saptamsha. In case of the wife, the antardasha of Venus is aspecting the 5th House and with 5th Lord in Saptamsha.